Wearable technology has attracted a lot of interest in the fashion industry lately. But now computer software giant Microsoft, and other large companies are beginning to explore the potential of this new technology. 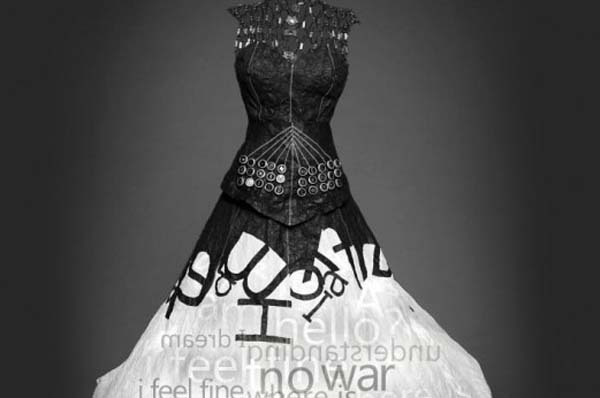 Two women at the Microsoft Research Centre have designed a dress which Tweets. Named The Printing Dress, the design duo, Asta Roseway and Sheridan Martin Small, say that at the outset of the project, they visualized the concept of a fashion garment which incorporated wearable communication forms like tweets. The result. A dress made almost entirely of black and white rice paper which aims to be high fashion and totally hi tech. The laser cut buttons add a romantic touch to a hi tech garment; whimsically reminiscent of the keys of an old fashioned typewriter. But although it’s fashionable, everything about the dress is functional – it comes equipped with a laptop, a projector and four circuit boards. Roseway, who is a senior research designer for Microsoft says that the dress does not only represent an exploration of the intersection of fashion and technology. In a world where communication is rapid and increasingly done remotely Roseway explains, the concept behind the dress also embraces the notion of accountability for what we say. Not only ‘you are what you wear’ but you are exposed to the world at large in terms of determining what you are by watching what you have to say. Although it’s a prototype and not meant to be worn, the wearer of the dress could theoretically type messages on the bodice keyboard, and those messages would be projected onto the skirt for the world to see. You are probably familiar with that old saying, ‘You are what you eat,’ but how about ‘You are what you Tweet?’” Roseway says about the dress. “The dress looks toward a future with a new realm of social accountability, where you literally wear what you Tweet. Our words aren’t out there; they’re on us”. Interesting! Cyber bullies take note. The women and their dress won Best Concept and Best in Show at the 15th Annual International Symposium on Wearable Computers in San Francisco in June this year. Roseway says that she never expected to win but is nevertheless delighted with the result. “It sends a message that we want to be just as involved in wearable technology as everyone else” she says.